Summer is the best time for new hair color ideas and experiments. It’s the best season for big transformations and new looks. We are happy to share with you some of the most popular light hair color trends for summer. If you haven’t gone for a big change in your style and look then let’s start it right here and right now. Check out our list and choose a matching shade of blonde, brown or pastel according to your skin tone and eye hue. Something between golden blonde and rose is called rose gold. This trendy hair color is one of the bests for women with fair skin and light eyes. It is ideal for the sunny summer as the dazzling rays of the sun beautifully bring out all the rosy and blonde shades. The best hairstyles to match with rose gold hair are loose and textures waves as well as finger waves and many other natural-looking wavy hairstyles. You may also opt for some cute braids ad updos to feel more convenient on hot days. 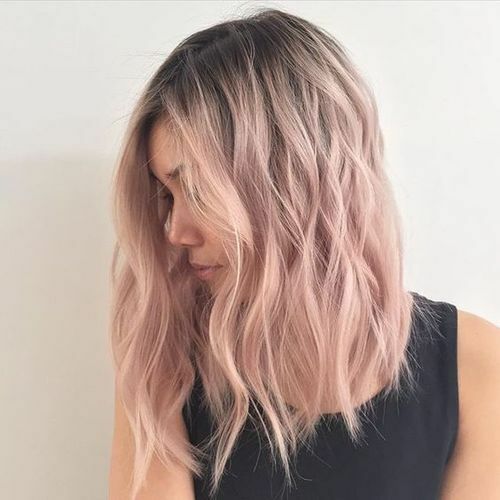 Compared to pastel hair colors rose gold is richer and shinier in its sun-kissed effect. Those with tanned or dark skin tone can rock this hair color only if they keep the roots in their natural dark tone. It will provide with much balance and beauty. The next appropriate summer hair color for this year is the beach blonde. It never goes out of style in summer because ladies like to wear beach waves with matching hair colors. The best part about this hair color is that it works well both with light and dark skin tones and looks awesome both with light and dark eyes. The only thing you need to pay attention is the tone. Consult with a professional hair colorist to opt for the right tone of beach blonde for your hair. Dark-skinned beauties can keep the roots darker or go for some highlights. Matching hairstyles are again beach waves, textures and braided hairstyles. If you are a brunette with warm skin and want to opt for a natural style and look then your choice may be the light golden brown hair color. This rich hair color is fantastic when you combine it with caramel highlights. This hair color adds more shine to your locks and sparkles under the rays of the sun. It is perfect with straight and thick hair but if you have thin locks you can style them in wavy and voluminous hairstyles or go for short bob cuts. While some Scandinavian women are blessed with the magical ginger hair color others go for the light copper to achieve the same result. However, lately many stylists offer high-quality hair colors that provide with more shine and beauty. As a result you reach a shinier copper hair color for the hot summer. This eye-catching hue goes well with light blue and green eyes and looks natural with light or fair skin tone. Try to get a natural effect by using the best tone for your complexion.